and May 5th for Morning Sadhana and Post White Tantric Yoga Integration Workshop! SIGN UP FOR THE WTY WA NEWSLETTER To Keep Updated with the latest information. To make your stay more comfortable during White Tantric Yoga Washington Course Stay Onsite at the Red Lion. Standard Double Guest Room: $130 plus applicable tax of 14.4% per room per night.for our group. On-site day-of registration Saturday 5/4/19 at Red Lion Bellevue. Doors will open at 7:00am. Payment must be Credit or Debit Card (NO cash and NO Personal Checks will be accepted). *No requests for a refund or credit will be accepted after 30 Days before the course date. Vegetarian lunch provided (vegan, gluten-free). Yogi tea will be served during lunch (vegan and dairy options available). We will also have spring water dispensers and organic fruit available while supplies last. Please bring your own unbreakable water bottle and any light snacks. Please refrain from wearing perfumes or spraying essential oils, as it may disturb others. It is hard to predict end times for White Tantric Yoga, as the actual finishing time on that day will be based on the length of kriyas and breaks. Courses typically end around 6, but occasionally can go later. Head covering info document here. Expand your spiritual awareness, increase your intuition and self healing. The day will take you through a series of experiences just challenging enough to touch your own excellence! You will be treated to a welcoming and warm environment, ample rest periods, fruit (while supplies last), water and a vegetarian lunch. Please wear loose-fitting white clothing for comfortable sitting, including a white cotton head covering. (You must wear a head covering to participate in the course). Bring a cotton blanket or sheepskin and pillow to sit on, and a light blanket or shawl to cover yourself during the rest periods. Please refrain from wearing perfumes or spraying essential oils, as it may disturb others. 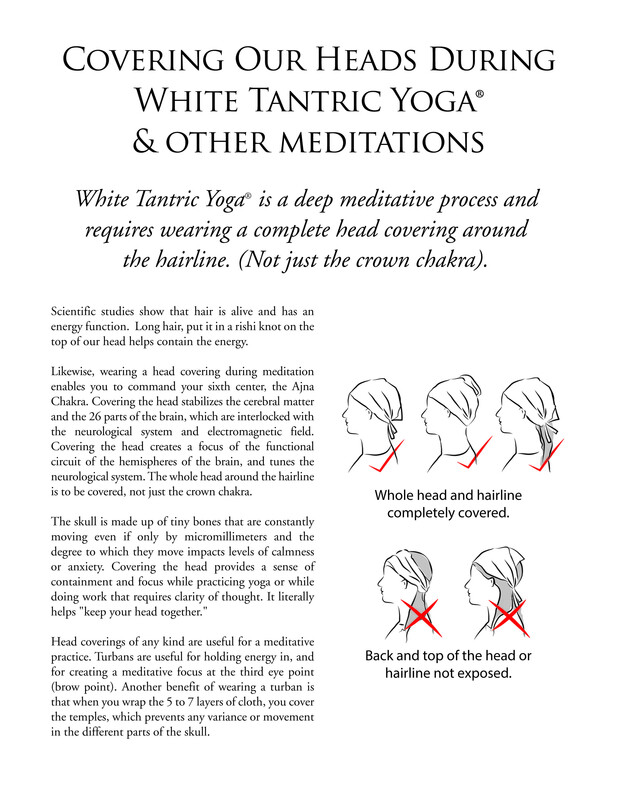 White Tantric Yoga WA © 2018-2019. All Rights Reserved.